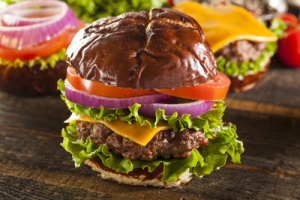 Bison Meat vs. Elk Meat – What’s the best burger? Our simple recipe works well for all three kinds of meat and we hope that you will find our bbq technique of interest as well. Our old Weber Kettle grill is the perfect tool for preparing awesome burgers – be it beef, elk, or bison meat. Prep is the longest part of this recipe. Since we will be cooking over hot a live charcoal and wood fire the burgers will cook in about 8 minutes, so the actual time on the grill is pretty short. 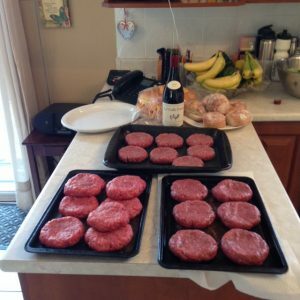 We have divided prep in to two parts – burgers and grill. 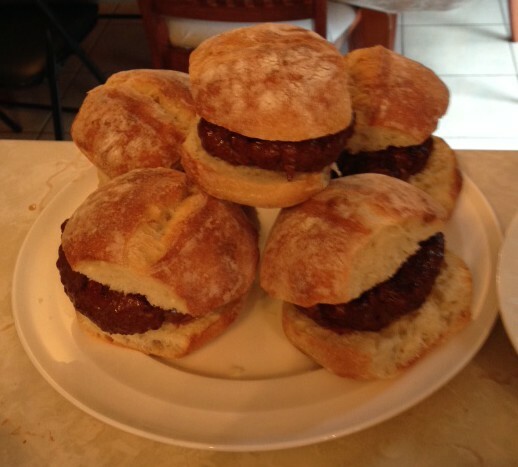 The same recipe was used for all three meats and is pretty much as follows below. Given that we are “rough-and-ready” range cooks weights and measures are not exact, and you should feel free to adjust and improvise. The main thing (in my opinion) is not to add additional strong flavors that would prevent full enjoyment of the natural meat. For example, do not add barbecue sauce or hot spices. Keep it simple and then you can always add condiments when you eat. You will find that you and your guests will want to savour the flavor of all natural bison meat – so let folks season the meat on the bun if they desire rather than putting pepper into the meat. So, mix up the ingredients and form burgers about an inch and a half thick. They should be a little thinner in the middle than around the edges because the middle will swell up anyway when they cook. 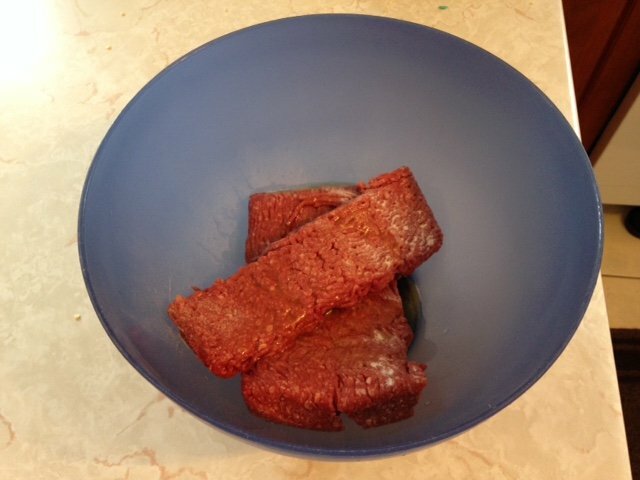 Use just enough olive oil to help the meat stick together and add a bit of fat to the very lean elk and bison meats. The bison burger prep definitely required some olive oil – different from the beef. Most of the added oil will end up in the cooking fire in any case, so it’s a good idea to add a bit in order to help the leaner meats adhere into burgers and to retain juiciness under high heat. Elk burgers are simple to make, and the lean meat will stick together well with the addition of a splash of olive oil. Use some garlic salt (or plain sea salt) but you will want to savour the taste of grilled elk meat with no additonal seasonings. There’s a reason why elk meat is so popular. Taste it and see. 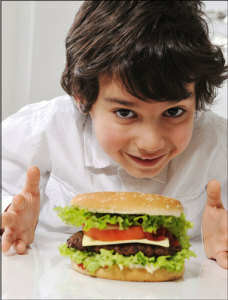 You are likely familiar with beef hamburger prep. Here you can use minimal oil (or none at all) according to your usual procedures, and garlic salt to taste. I usually go light on the salt with beef because most people will be adding salty condiments like ketchup, mustard, relish, etc. Here’s a photo at left of the three kinds of burgers ready for the grill. The wine is for the chef. We are going to be cooking with live fire, just like cowboys on the range. You will see that we are using natural lump charcoal in the Weber Kettle, and I will add a small hardwood log as well in order to get an amazing natural wood smoke flavour on the meat. You can buy bags of wood chips as well. I like hickory and oak with burgers. I am going to use a small maple log today – left over from a camping trip this summer. Most hardwoods are good for cooking and adding wood smoke flavour. Fruit trees, like apple, add a very light taste, so are best reserved for fish or poultry. Mesquite is also a good option for red meat – and is my favorite with a rib steak. Light the charcoal about 30 minutes before you want to start cooking. We are using a metal lighting chimney in order to start the natural charcoal without using any accelerants. 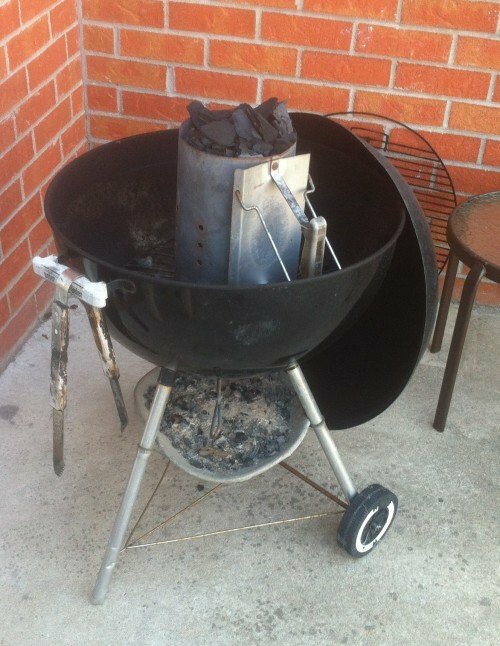 I definitely recommend this method in order to keep lighter fluid out of your grill. 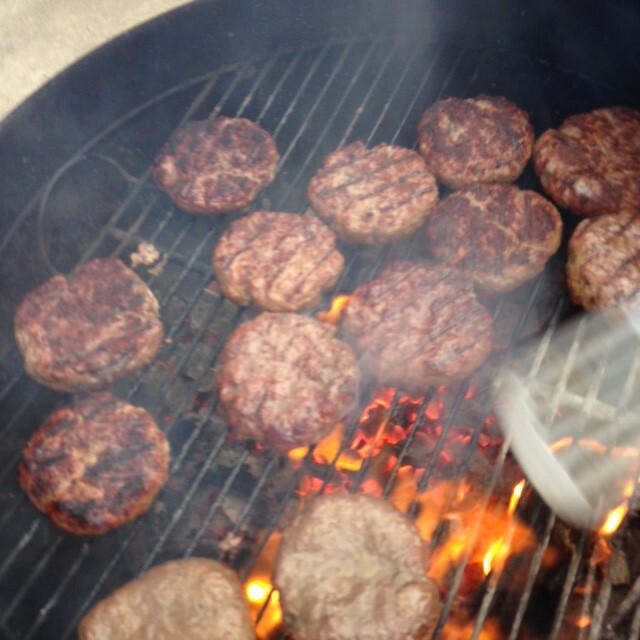 Here you can see the bison and elk burgers on the grill. The yellow flames at right are from the hardwood log. Once the bison burgers and other meats have been prepared for cooking, and the fire has started to burn down a little bit, we are ready to fire the beef burgers. We are going to put the bison burgers and elk burgers on the grill after the beef because they will cook a little faster. The beef burgers will cook over our hot fire in 8 – 10 minutes, and the natural bison and elk meats will be ready to eat in a minute or two less. Cooking game meats like elk and bison over a live fire is a challenge for any barbecue chef. The mix of meats and the natural variation in temperature around the grilling surface means that the cook must be alert at all times. Don’t drink too much wine before dinner as you will need your wits about you in order to cook the meat well and avoid getting burned. After 4 minutes on the first side it will be time to turn the burgers over. 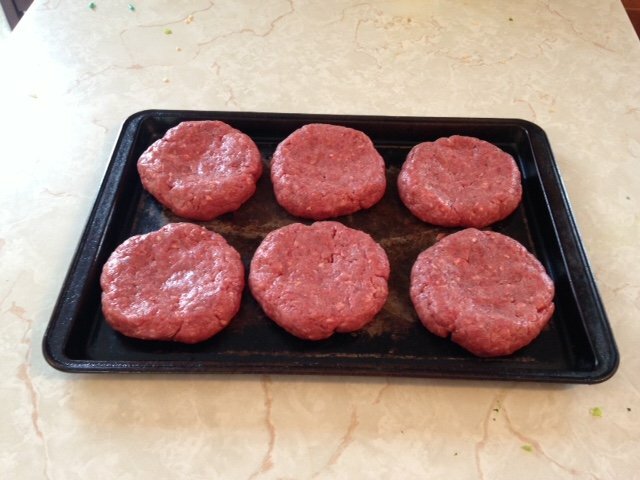 Take the opportunity to rotate the burgers – moving those that are more done to cooler parts of the grill, and using the hottest spots for those bison burgers that may have been in a cooler spot while cooking on the first side. 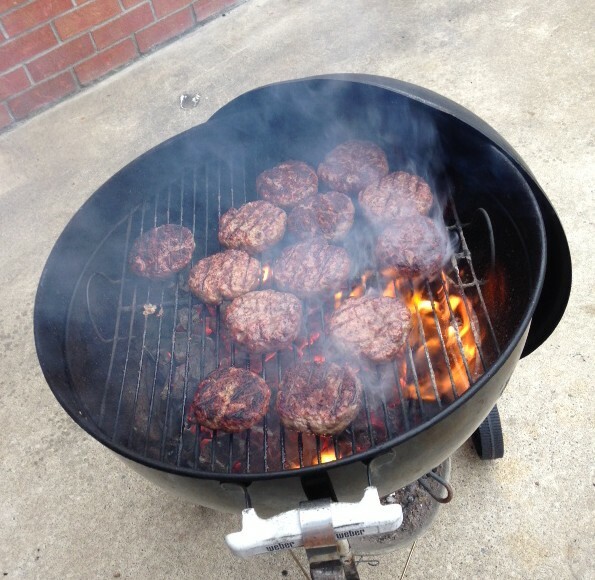 Don’t place any burgers over the wood as it will tend to flare up more than the charcoal. The burgers are of the grill and ready for final prep for the table. The chef (and sous-chefs as available in the family) need to work fast to get the meat onto plates and into mouths in peak condition. Ideally the burger should be eaten 4 – 6 minutes after cooking is complete – and the bison and elk burgers should be served medium rare. Our burger tasting team assembled to enjoy the Bison Vs. Elk face-off. 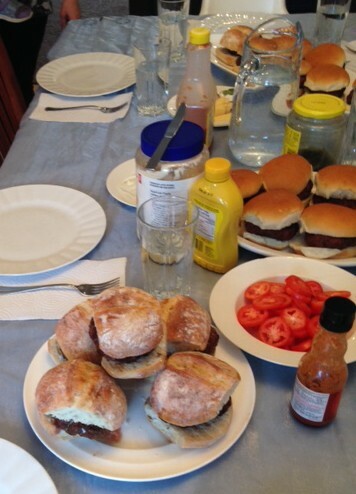 You can see the virtual mountain of burgers that was assembled – with options for standard white-bread buns, or a more substantial toasted ciabbata bread. The judges deliberated, eating multiple burgers each, and finally reached a conclusion. Read on for the detail on what burgers were preferred. 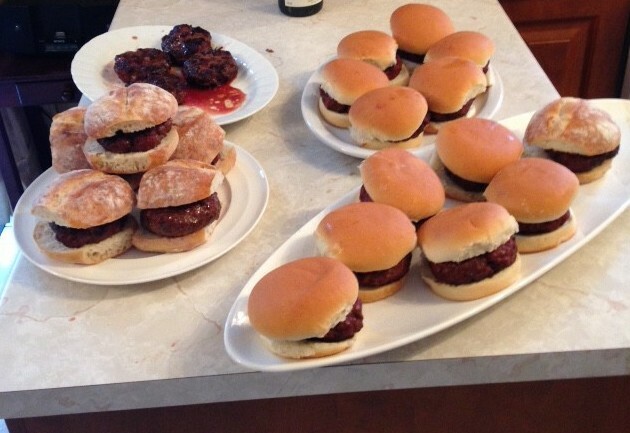 The announcement of the winner must be prefaced with the info that all the burgers were very good, and all got eaten. There was no loser in this contest. All meats are great when cooked with this method. The Best Burger – Elk Takes It! Our conclusion was that while all three burgers (bison, elk, beef) were delicious – elk was the most flavourful and the clear winner. Elk was preferred for flavour and texture. It had the most taste of any of the meats and seemed not to need as many toppings. 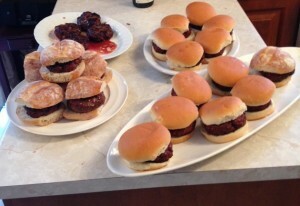 We were content to enjoy the elk burgers with minimal condiments because the natural flavour was so good. 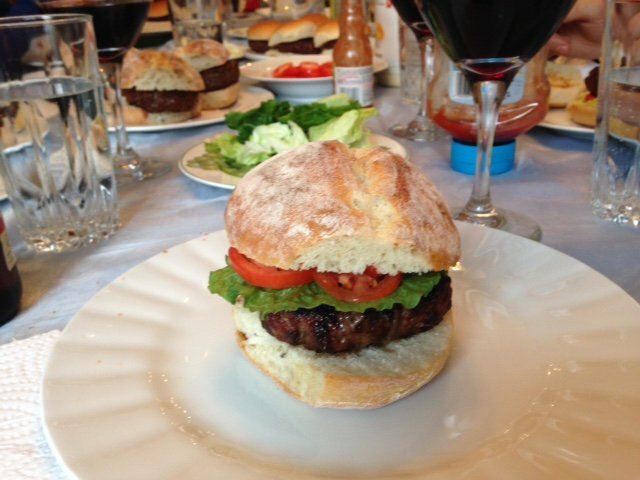 The bison burgers were second choice, with beef bringing up the rear. All the meats were good, but the game meats were both winners for taste. Elk was also the leanest meat, and had the most solid texture in the mouth. The Classic Bison Burger Makes A Wonderful Meal. It’s meaty, juicy, full of protein and fun to eat. If you add a lot of vegetable toppings, it’s even more nutritious. It’s so easy and versatile to prepare, whether on BBQ, in a fry pan or in the oven. Kids love it. Just about everyone does. Mix all burger ingredients together and form patties. Refrigerate. In a large frying pan, heat the oil and fry shallots until golden brown. Remove them from the il with a slotted spoon and transfer to paper towelling to drain off excess oil. Cook the bacon. cook patties 5 to 6 minutes on each side. See more tips on cooking patties on our blog.